The annual festival at the Sree Kurumba Bhagavathy temple situated at Kodungallur in Thrissur district is known as the Kodungalloor Bharani. It takes place in the Malayalam month of Meenam. Majority of the people that take part in the festival are from the northern regions of Kerala, collectively called as Kadatha Nadu. The rituals at the temple are believed to have originated from the ancient ties between Kodungallur and the region under the Chera rule that also had their second capital – Thondi. Kaavu Theendal (defiling of the sacred grove), hoisting of festival flag without rituals, kozhikkal moodal (covering of hen stone), ceremonies performed by a fisherman called Palakka Velan are the festival specialities. Aswati kaavu theendal is the most important of rituals. On the day of Meena Bharani there are no celebrations in the temple. All festivities start from the day of festival flag hoisting, which is on the day of Bharani asterism in the Malayalam month of Kumbham till Aswathi asterism in the month of Meenam. The ceremony jointly performed by the goodhearted Veeraasaari and Malayan Thattan is an important one. Thattan will ring the handheld bell and defile the temple premises by circumambulating it. This is followed by the sanctification of the temple by the Moothanmars of Plappilli ancestral house. The tying of flags on banyan trees and minarets around the temple mark the beginning of the period of Bharani. Songs featuring vulgar and obscene words are sung by devotees, who come from places like Wayanad, Kannur, Thalassery and Palakkad. Kaavu Theendal takes place on the Aswathi asterism. Towards noon, by 11 o’clock, the northern entrance to the temple will be closed and no one is allowed to enter the temple. After the mid-day offerings, a secret offering called Aswathi pooja is also done. After removing all ornamental adornments from the idol of Goddess Bhagavathi, sandal paste is applied. The oracles taking part in Kaavu Theendal will gather in the courtyard of the Vadakedath Mutt, situated on the eastern side of the kaavu (grove). After the temple is opened, the ruler of Kodungallur Kovilakom is welcomed by devotees and the officials of the temple. After drinking tender coconut juice given to the ruler by Paalakka Velan, the ruler will order the namboothiri to lift the silk parasol. Paalakka Velan will be the first to do the kaavu theendal (defiling of grove). This is followed by defiling of the kaavu by oracles and devotees, who will also hit the temple rafters with wooden sticks. And they circumambulate the temple three times. 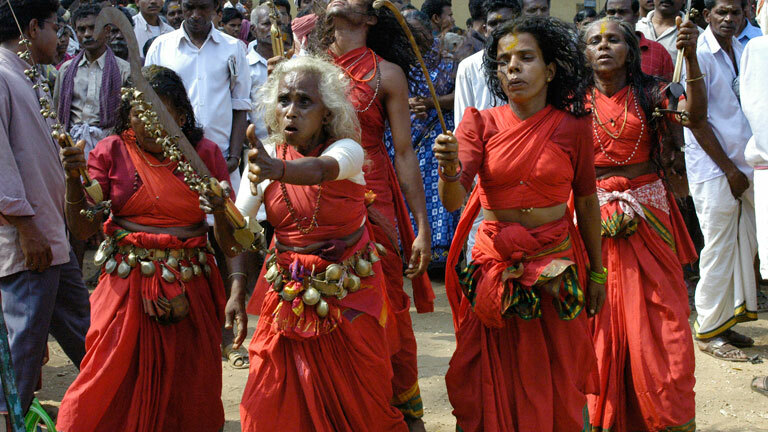 The kaavu theendal ceremony is held amid songs of devotion and those that feature vulgar and obscene words.